Vancouver city council has approved the relocation of Edgewater casino from its False Creek home to a proposed entertainment and hotel complex next to B.C. Place. 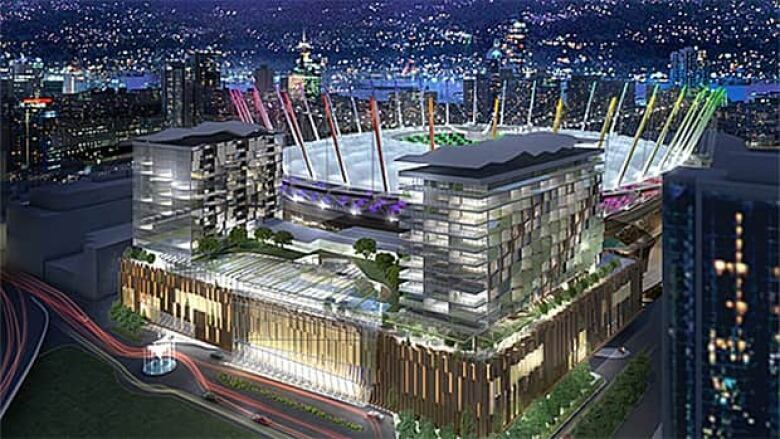 The proposed casino would have included 1500 slot machines along with two hotels, restaurants and shops next to the refurbished BC Place. Vancouver city council has approved the relocation of the Edgewater casino from its False Creek home to a proposed entertainment and hotel complex next to B.C. Place. But councillors have re-affirmed an April decision not to permit Edgewater's request to more than double the number of slot machines and gaming tables at the new location. Council says a number of restrictions will ensure that any new casino would have no more gambling facilities than the old one and any proposal for gaming expansion would require more public hearings. Vancouver mayor Gregor Robertson says he stands by his election promise to prevent such gaming expansion. "The majority of councillors, myself included as well, were very clear we were not in support of any further expansion of gambling for this next term, and elected under those conditions," said Robertson. "So, to make it as clear as it possibly could be, there will be no expansion of gambling on my watch." But Sandy Garossino with the anti-gambling coalition Vancouver Not Vegas says the new facility could easily accommodate an expanded casino. "What has been approved by this council is the construction of a mega casino shell. What it's shut the door on is the number of slot machines that they'll allow to be put in there. So we're saying shut the door today," Garossino said. The original expansion project was proposed last year by Las Vegas-based Paragon Gaming Co. and envisioned Western Canada's biggest casino on the north False Creek property between BC Place stadium and the Cambie Bridge. As well as restaurants, shops and two hotels with a total of 500 rooms, it also included around 1,500 slot machines and would have seen the casino triple in size. Proponents of the plan said expansion of the casino's gaming facilities would create jobs, attract money from wealthy offshore gamblers and inject millions into the economy in taxes and revenue. But a coalition of residents, social agencies, health officials and retired senior police officers mounted a vocal fight to stop the project, saying the costs to society were not worth the financial benefits. Days of hearings were conducted before packed public galleries prior to the council decision to reject expansion of the casino's gambling facilities in April. While Edgewater's move to B.C. Place and the construction of an adjoining hotel and entertainment complex has been approved, Paragon Gaming has yet to submit a revised proposal for a smaller gaming facility.